Dr. Terrell Morton is part of the inaugural cohort of Preparing Future Faculty Postdoctoral Fellows for Diversity at MU. He obtained a Ph.D. in Learning Sciences and Psychological Studies from the University of North Carolina at Chapel-Hill, a Master’s of Science in Neurobiology from the University of Miami, and a Bachelor’s of Science in Chemistry from North Carolina Agricultural and Technical State University. 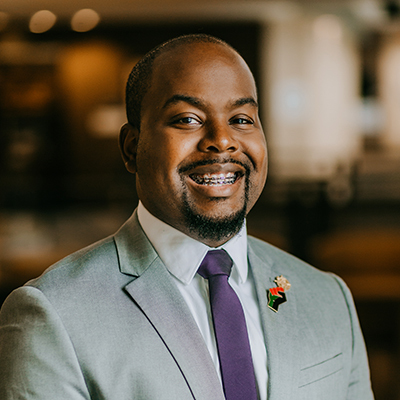 His research focuses primarily on student retention and matriculation in postsecondary education, including foci on the retention and matriculation of Black women in STEM, retention of Black students, and retention of underrepresented populations (i.e., transfer students, first-generation college students, students from rural communities, and student-athletes). Dr. Morton’s work involves investigating the influence of identity development and expression (e.g., racial identity, gender identity, and intersectionality) on students’ perceptions, experiences, and engagements. He is trained in qualitative methodology and takes a critical perspective – informed by Critical Race Theory – with all of his work.